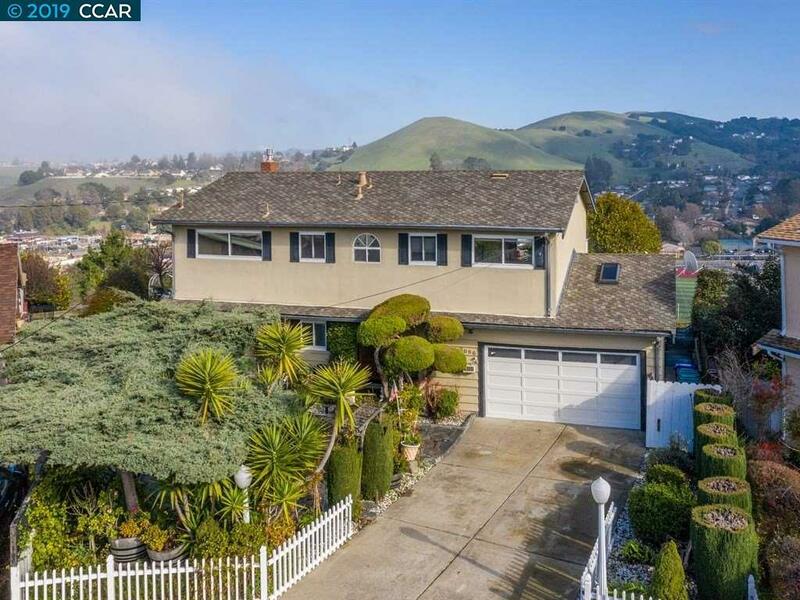 Spectacular Panoramic Views of the hills and the Bay in Pinole Valley! Located at the end of cul-de-sac, this property offers breath-taking views! Beautifully landscaped front and back yards. The living room has a remodeled gas burning fireplace and granite tile flooring. Large formal dining room. Spacious kitchen has refinished cabinets, granite countertops, and new microwave. Beautifully updated hallway bathrooms. Expanded master bedroom has a large deck to enjoy the breath-taking views. Dual pane windows, custom BaliÂ® blinds throughout, newer 50-year roof and new gutters. Hardwood flooring under the carpets. Freshly painted interior. Backyard has large decks, a chicken coop and BBQ pit. Over 20 different fruit trees! Walk to Elementary & High schools, restaurants and shops. Easy access to FWYs makes it ideal commute. Don't miss out on this wonderful home in one of the most desirable neighborhoods in Pinole.